On Tuesday’s Mark Levin Show, The communist Chinese interfered in a federal election to benefit President Bill Clinton and the Democrats during his re-election campaign in the 1990s. 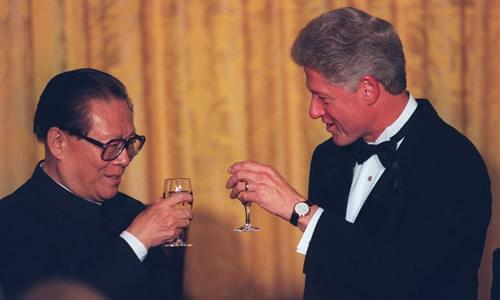 China’s intelligence chief provided Johnny Chung with information that he revealed damning grand jury testimony confirming that China preferred Clinton as President of the United States. Chinese money also infiltrated our elections through illegal campaign contributions. Despite all of the Clinton collusion with China, there was no special counsel; no independent counsel or unending string of Congressional hearings. Yet the veiled coup on Trump’s campaign and presidency were met with even further attacks on Trump from the very same people under President Obama’s watch. Then, CNN ratings are so bad that the Democrats have turned to Fox News for their Town Hall Meetings. Bernie Sanders took to Fox News to sell his socialist plans to bankrupt America in Soviet fashion. Pretending that there is no Medicaid, Obamacare, or Medicare. Once again autocrats persuading people to become enslaved by their government. Later, four Jewish Democrats with ties to AIPAC warned Israel not to annex West Bank territory. There has always been a fifth column in the Jewish community. They are leftists who’ve never lived in Israel, yet they claim to support Israel from afar but their actions contradict that.